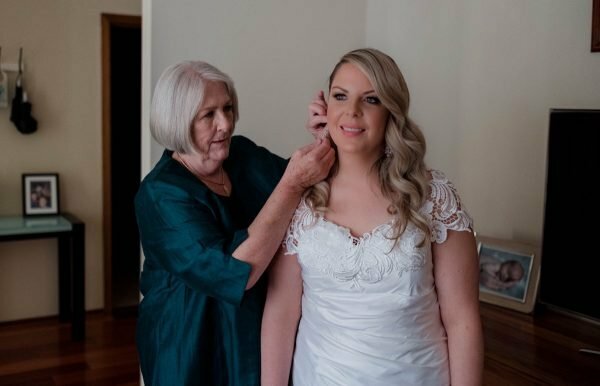 Adelaide wedding: MND sufferer Lara Huddleston walks down the aisle. Welcome to Wedding of the Week, the five-part series lifting the veil (see what we did there?) 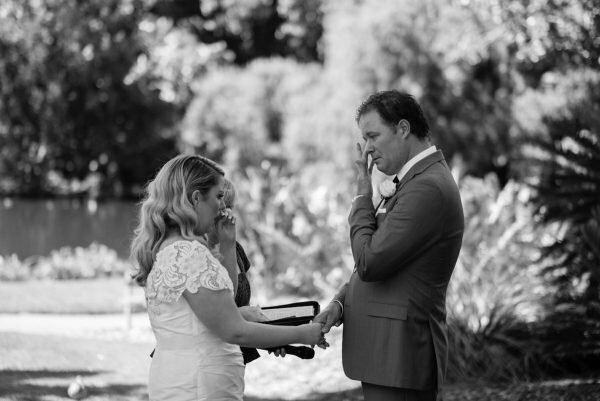 on real weddings from our Mamamia readers. 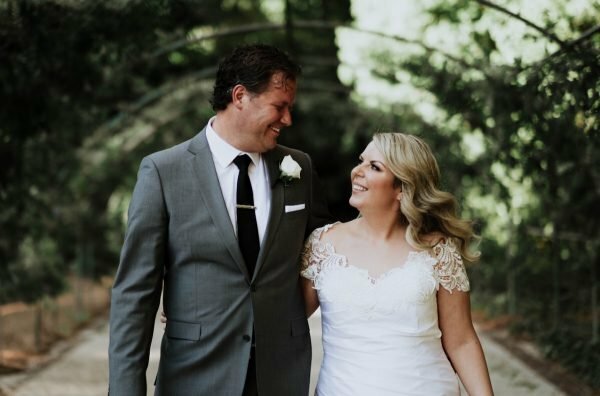 Each week, we’ll deep dive into one Aussie couple’s wedding day to bring you all the details about the important stuff – the dress, venue, food, flowers, photography and words of wisdom. 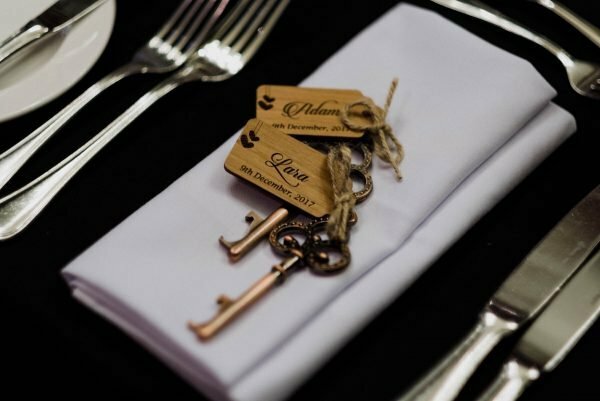 This week’s Wedding of the Week is Lara and Adam’s. 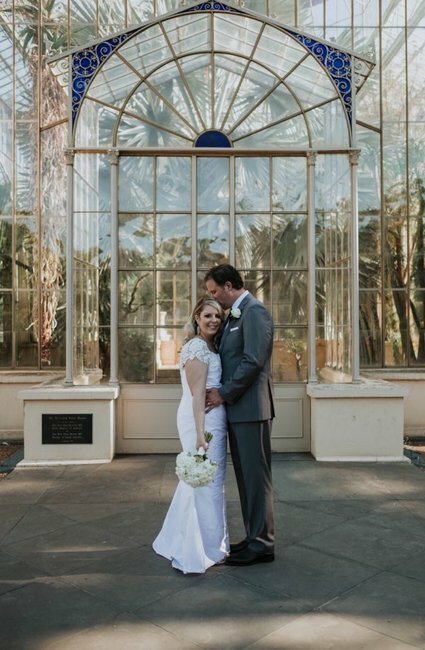 When Lara was diagnosed with Motor Neurone Disease in September 2017, she and Adam rushed to plan their wedding so Lara would be able to walk down the aisle unaided. It wasn’t the wedding they thought they would have, but they said the day was perfect. Who: Lara, a 34-year-old former registered nurse, and Adam, a 42-year-old geologist, from Adelaide, SA. Wedding date: December 9, 2017. Number of guests: 150 for the ceremony followed by an intimate reception for 30. Lara and Adam&apos;s love story. "Adam and I met online and we hit it off through texting straight away. He was going through a divorce with two young children, and I was very hesitant at first having just come out of a difficult relationship. We decided to meet at a beer cafe and the spark was there as soon as we hugged hello." We had a really lovely evening full of great conversation and laughter, and as he was walking me back to my car, it was like time stood still for a moment and we were lost in each other. I drove off that night knowing I had just met the love of my life, and somehow, we would be together one day when things were more settled. "I knew I had met my future husband, I had no doubt in the world. We stayed in touch via text and coincidentally saw each other at the cricket one day. From then on, we started dating officially and fell in love very quickly, moving in together after a few months. Adam proposed at the Eiffel Tower in May 2016, we were six months pregnant at the time. Baby Thomas was born in August 2016, and we had planned to be married in May 2018. 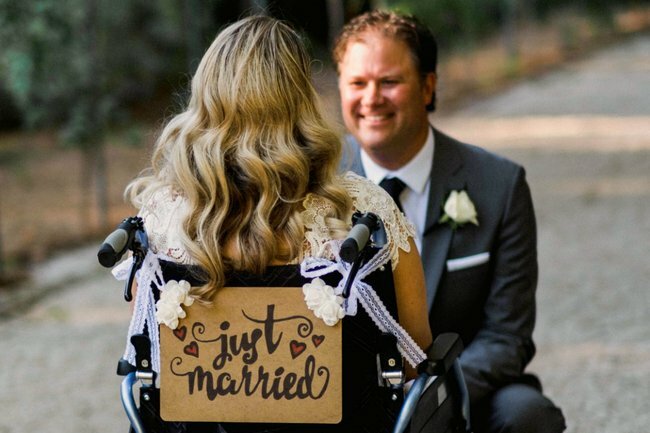 "However, after I was diagnosed with Motor Neurone Disease (MND) in September, 2017, we decided to get married straight away so I would be able to walk down the aisle without the aid of a wheelchair. 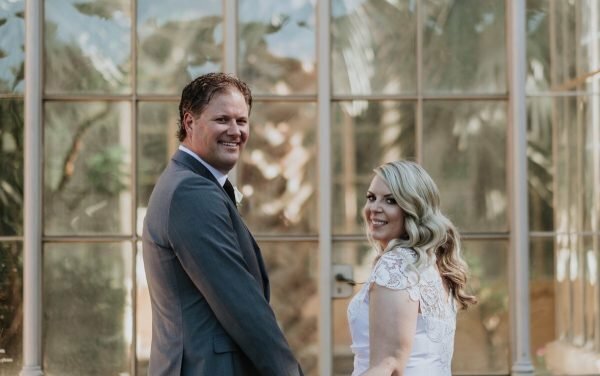 So the plans we had went out of the window and we planned the ceremony and reception in two-and-a-half months, it was a completely different wedding to what we had originally planned, and we couldn’t have been more happy with the way it turned out, it was so meaningful and full of love. It was the perfect day." "I only had eight weeks to find my dress, which was really stressful. I spent a day with my mum at several wedding dress stores and some were OK, but not quite right. Time was running out and there were very few dresses on the racks in my size, they were all very small or very large. I was getting very worried." 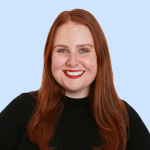 "After spending all day on the Saturday with no luck, I walked into designer boutique Alexis George on the Monday and told [designer] George Georgiou my story. My mother-in-law came with me and George greeted us at the front entrance, I immediately felt safe in the environment. 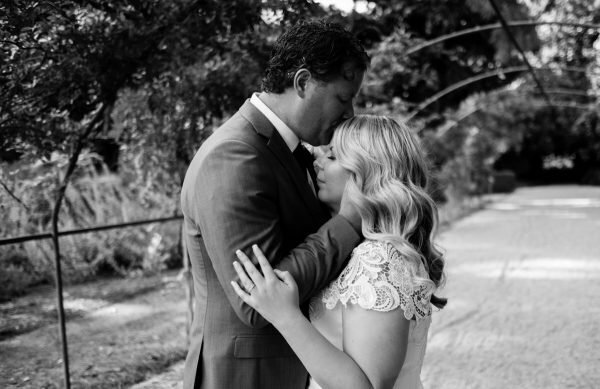 "He had me in a beautiful dress after a few minutes, even adding lace detailing to it. Myself and my mother-in-law looked at each other and knew it was the one. 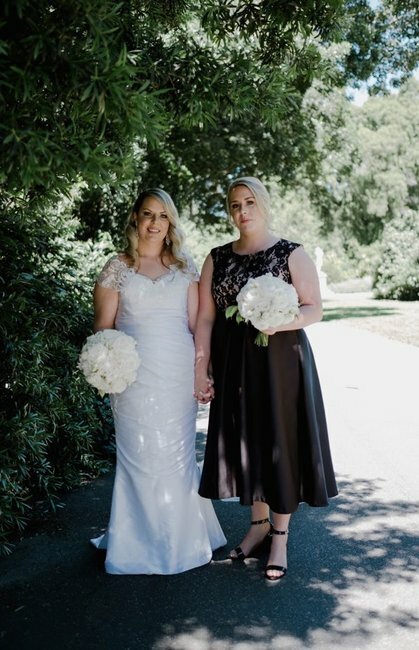 My sister, mother and best friend also came to look at the dress a few days later, George is such a beautiful man and calmed all of my worries." Lara&apos;s bridal hair, makeup and final touches. 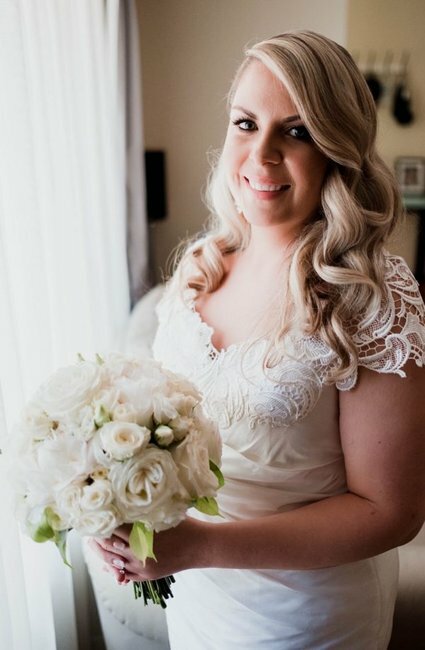 Wedding makeup: Caitlin Rose Makeup from Ritual Hair. 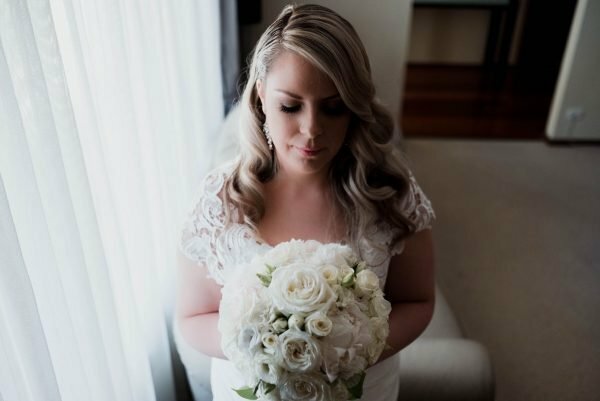 Wedding hair: Fleur from Ritual Hair. 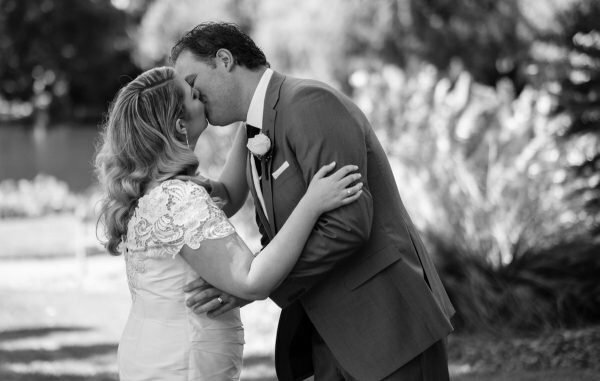 "I wanted to look timeless, simple, feminine and classic on my wedding day. It was also important to me that my son and his future family will be able to look at the photos and hopefully they wouldn’t have dated too much. 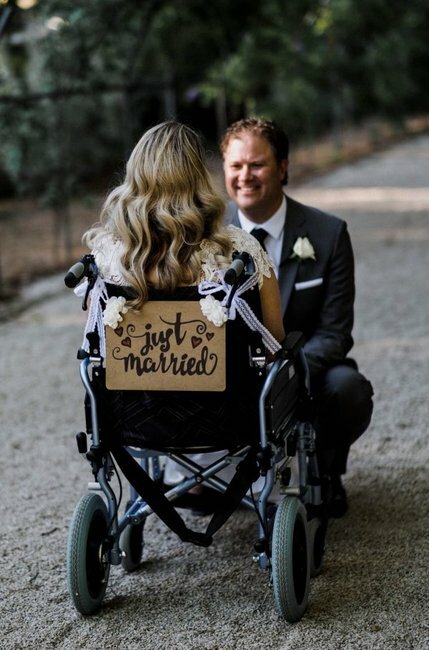 I wore just a pair of drop earrings, and I had my wheelchair for when we had to do a lot of walking with the photographer as I could only walk a small amount at the time." 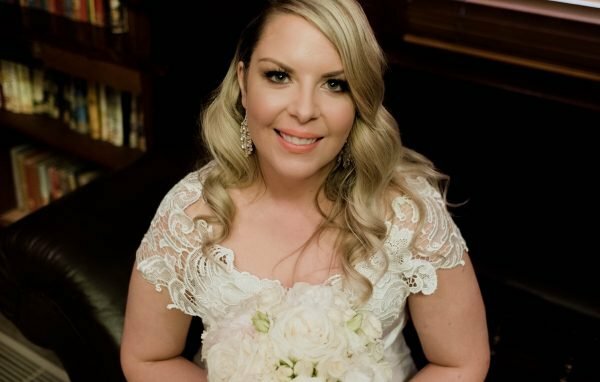 "I hadn’t lost all of my baby weight that I had wanted to by the date of our wedding, however, I’m very confident and decided to embrace my shape. 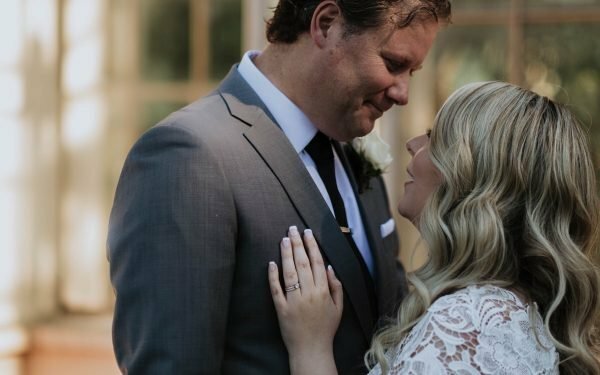 My husband always makes me feel so beautiful, as soon as our eyes met, I knew I looked beautiful in his eyes, and that’s all that mattered to me." Groom&apos;s outfit details: Peter Shearer suit. Bridesmaids outfit details: City Chic dresses, Myer shoes, and gold accessories. Groomsmen outfits details: Peter Shearer suits. "If we&apos;d have had more time, I would have included my two best friends in the wedding as bridesmaids. 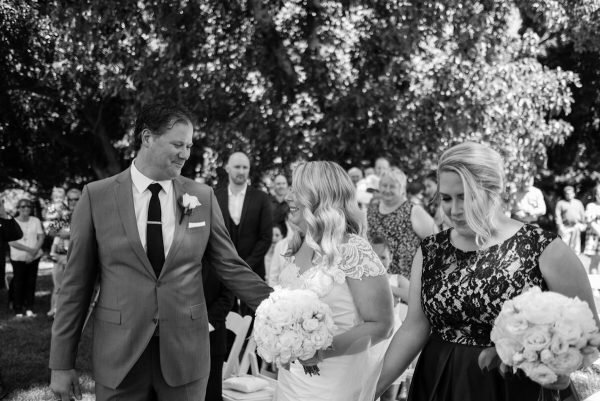 We kept it very simple due to time constraints, so I asked my sister to be my Maid of Honour and to walk me down the aisle, as my dad passed away from MND 15 years earlier. 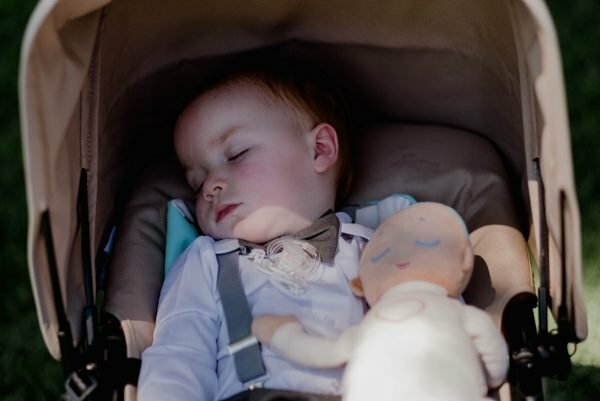 My one-year-old was meant to walk down the aisle with my mum, but he fell asleep!" 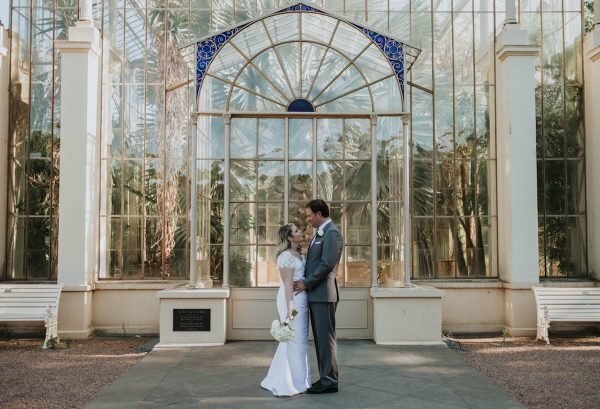 Ceremony venue: Adelaide Botanic Gardens. 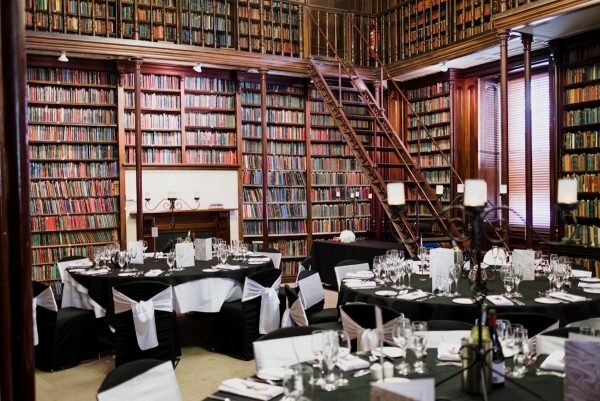 Reception venue: South Australian State Library. Flowers: Sam Burnell Floral Design. 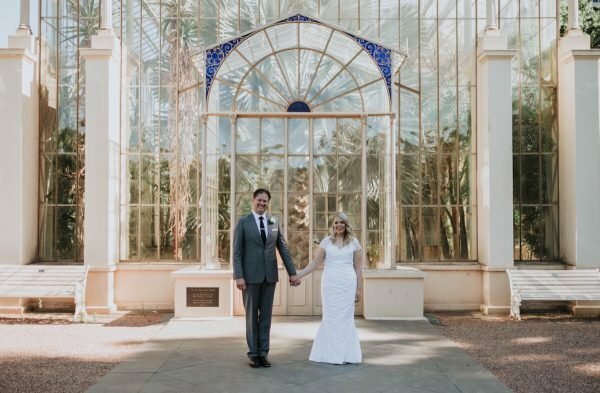 "We chose the Adelaide Botanical Gardens for our wedding ceremony and wedding photos, we had spent many of our dates there, having picnics, laying in the sunshine and kissing on the grass. 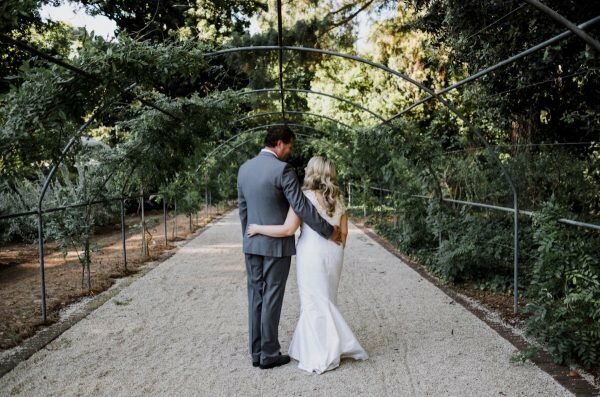 The gardens are very special to us, and we still continue to go there and enjoy how beautiful it is to this day." 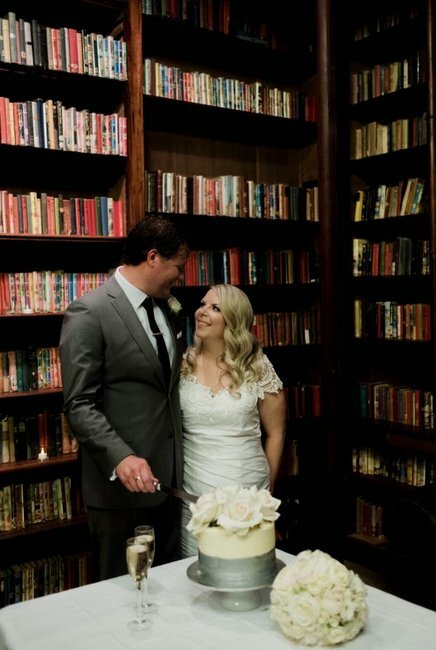 "The State Library organised everything including lighting and centrepieces, which was great as we were short on time when planning." 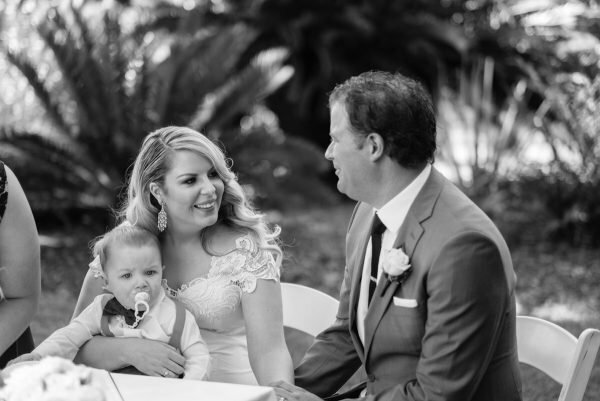 The moments that made Lara and Adam&apos;s wedding day special. "There were so many special moments. Having some alone time taking photos with my husband, sister and brother-in-law was great. I&apos;ll never forget taking in the beautiful sunshine at the botanical gardens, Adam wheeling me from the botanical gardens to the library in my wheelchair. And having some more beautiful alone time together just the two of us, and being so excited we were married. Rocking my baby to sleep at the ceremony, knowing we were now a united family, it felt very special." 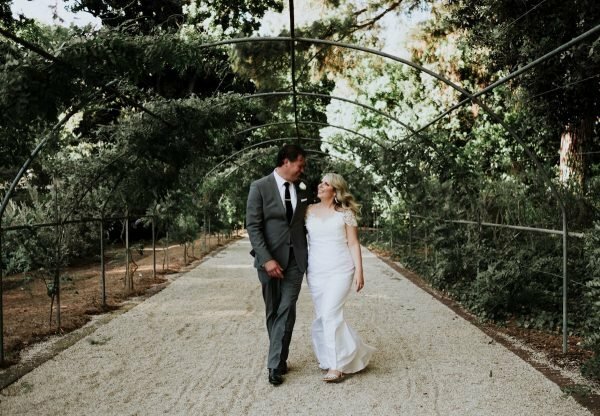 "Everything felt a lot more special than I had intended, I felt at one with my husband and even more close, which I didn’t think was possible. We are both very romantic at heart and from some of our earlier conversations in our relationship, we had always wanted to be married. 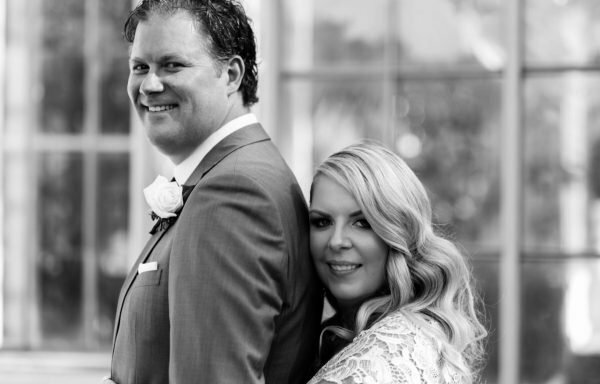 We both believe in the union of marriage, not necessarily the religious side, just the feeling of taking those vows and making those promises to each other in front of our closest friends and family was very important to us." Would Lara and Adam do anything differently? "Even though we planned things on such short notice, nothing really went wrong. My dress probably needed to be altered once more, but we didn’t have the time, so it was slightly too big around the waist. It was very windy on the day, so I had to keep taking my veil out, and I wish I had gotten more photos with my veil as it was beautiful. Otherwise it was perfect, I&apos;m really only nit-picking." "We&apos;d spend the same amount of money again. Even though it wasn&apos;t the wedding we&apos;d originally planned, we couldn’t have asked for more. My advice to other brides is: Remember to focus on what’s important, and that is marrying your partner. People won&apos;t remember the flowers, the cake or decorations, but they&apos;ll remember the love, harmony and fun, and how they felt being a part of the day. "Also make sure your guests are well looked after - give them a very nice meal and have the good alcohol flowing, it’s a celebration!" Vendor recap: Photography: Chasing Eve Photography, Ceremony venue: Adelaide Botanic Gardens, Reception venue: South Australian State Library, Flowers: Sam Burnell Floral Design, Wedding dress: Alexis George, Wedding makeup: Caitlin Rose Makeup from Ritual Hair, Wedding hair: Fleur from Ritual Hair, Wedding shoes: Forever New, Groom&apos;s outfit details: Peter Shearer suit, Bridesmaids outfit details: City Chic dresses and Myer shoes, Groomsmen outfits details: Peter Shearer suits. 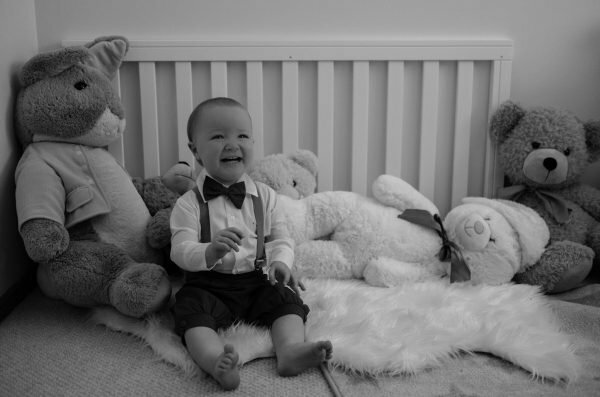 All images supplied by the couple and Chasing Eve Photography. 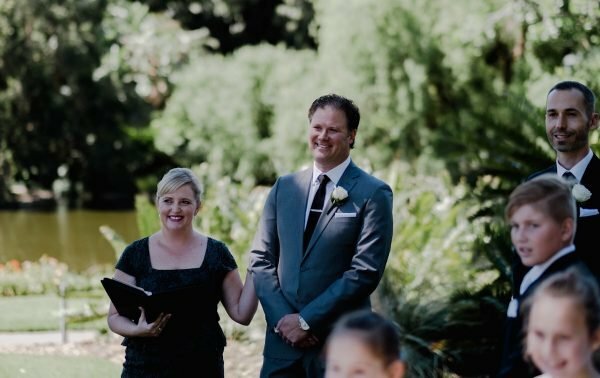 WEDDING OF THE WEEK: How Kylie-Ann and Jake got their dream &apos;non wedding&apos; for under $20K. 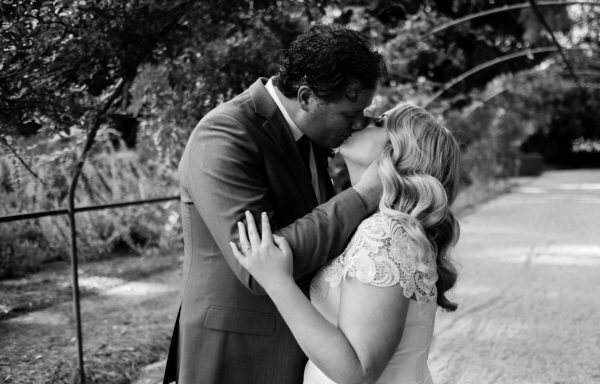 WEDDING OF THE WEEK: Liz and Andy&apos;s magical New Zealand wedding that "was a long time coming".